While watching Saturday mornings on CBS between 1990 and 1994, you might recall seeing a squiggly little character and his friends leading into and out of the commercial breaks. Yet, you may not recall ever seeing him on one of CBS’ many programs. That character was Fido Dido. Fido came about in 1985 when Sue Rose doodled him onto a napkin while out having drinks with Joanna Ferrone. After Ferrone named him, they decided to put his image on t-shirts with the slogan “Fido is for Fido, Fido is against no one.” That slogan played on the women’s pacifist beliefs in that it was good to care. Fido’s shirts took off and he gradually began to be featured on other merchandise. His popularity had risen enough to catch the attention of executives at PepsiCo in 1988. Starting in 1989, Fido began pitching their 7-Up and Slice products, as well as the Turkish soft drink Fruko, in commercials and on the packaging. Fido was tasked with luring in the youth market by emphasizing the uniqueness and coolness of the brands. Often times, the spots for the products would be the same, just with the product interchanged. In 1990, Fido was snagged by CBS to star in their Saturday morning commercial bumpers along with his friends: Lido Dido, who resembled Fido except for his sunglasses and attire; Doodles, a young girl; Doody, who resembled a clown; Eff Dee, a darker-skinned business-type; Boy, a young boy with a backwards hat; and Fido’s cat and dog Gato and Fido. The group starred in a series of short adventures both with and without voices and sometimes customized for particular programs. 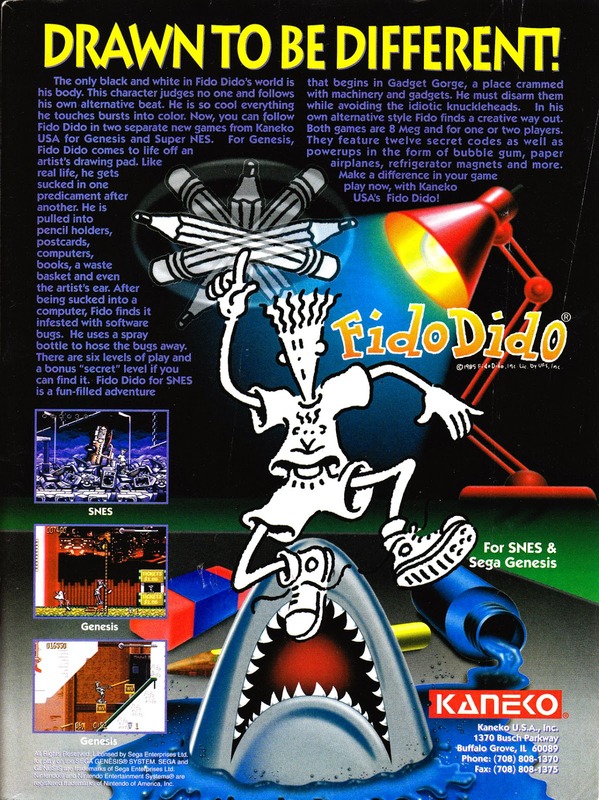 Ad for the eventually-cancelled Fido Dido video game using the intended box artwork. 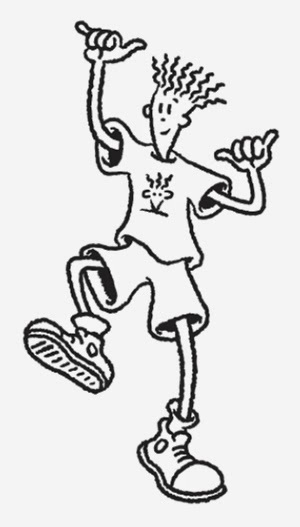 In 1993, Teeny Weeny Games was developing a Fido Dido video game to be released by Kaneko. The game was reportedly finished, previewed at Consumer Electronics Show 1993, and even received finalized box art. However, it was never released for unspecified reasons. Speculation was made that it was because Fido was replaced as the spokestoon for 7-Up by its other mascot Spot; an anthropomorphized version of the red dot featured in the logo. Spot instead received his own video game that year, the second after 1990’s Spot: The Video Game. A ROM of Fido’s game had been made and pirated versions have been known to be in circulation, with full game play videos posted on YouTube. It wouldn’t be until 2007 when Fido made an official move into the video game realm in mobile games developed by Jump Games in India. While Fido’s presence was diminished in the latter half of the 1990s, he continued on in comic strip form published in YM magazine. 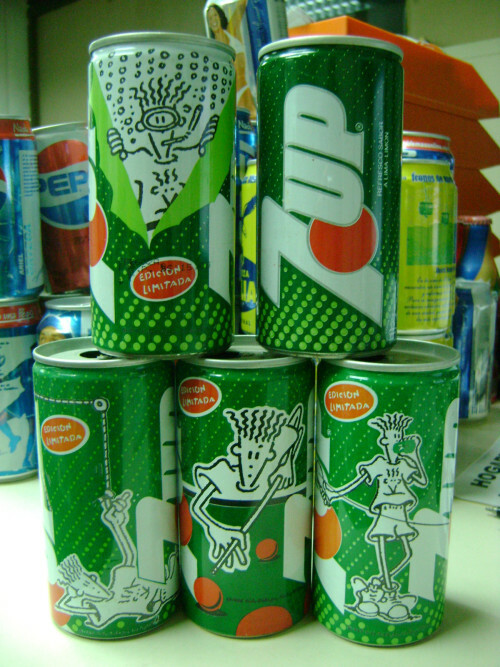 In 2003, Fido made a return to 7-Up in its biggest market: India. An aggressive campaign was centered around the character and his five core philosophies: “It’s cool to be you; Normal is boring; Your best friend is your head; Dare to be different; and Life is short—live it up!” His first new commercial featured a re-enactment of his creation. Gradually, as his commercials continued, Fido was brought into the three-dimensional world via computer animation, although left looking like his normal, flat, cartoony self rather than making him fit into his surroundings (in keeping with his philosophies).